To order over the phone call 1-260-255-9619 Monday through Friday 10:00 am. - 5:00 pm. Eastern Time. First class shipping is $3.00 with a tracking # for 1 sticker if you order more than 1 sticker at the same time I will combine shipping cost. International orders please E:mail:nostalgicnook1@frontier.com for estimated shipping cost. 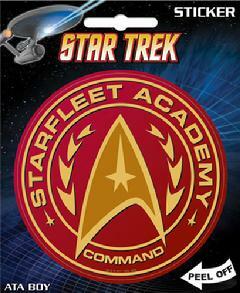 Item #451375 Starfleet Academy Command Sticker$2.95 ea. 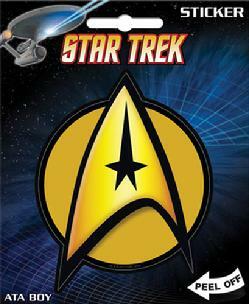 In Stock These officially licensed stickers are about 3" to 4" in diameter, full color, carded and poly bagged. 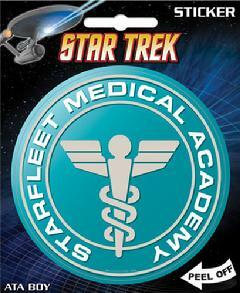 Item #451385 Starfleet Medical Academy Sticker $2.95 ea. In Stock These officially licensed stickers are about 3" to 4" in diameter, full color, carded and poly bagged. 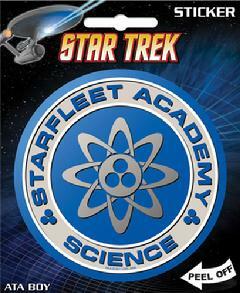 Item #451395 Starfleet Academy Science Sticker $2.95 ea. In Stock These officially licensed stickers are about 3" to 4" in diameter, full color, carded and poly bagged. 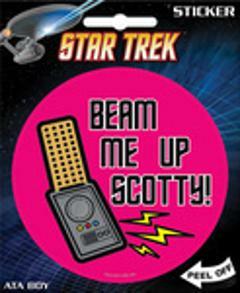 Item #451415 Beam Me Up Scotty Sticker $2.95 ea. In Stock These officially licensed stickers are about 3" to 4" in diameter, full color, carded and poly bagged. 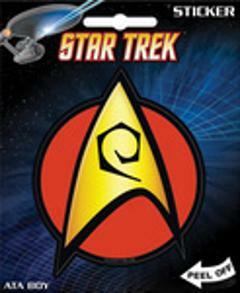 Item #451142 Captain`s Insignia Sticker $2.95 ea. In Stock These officially licensed stickers are about 3" to 4" in diameter, full color, carded and poly bagged. Item #45148 Engineering Insignia Sticker $2.95 ea. In Stock These officially licensed stickers are about 3" to 4" in diameter, full color, carded and poly bagged. Item #45144 Science Insignia Sticker $2.95 ea. In Stock These officially licensed stickers are about 3" to 4" in diameter, full color, carded and poly bagged. 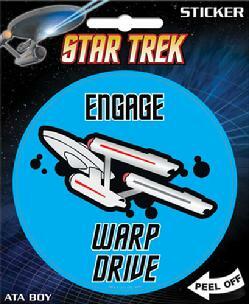 Item #451143 Engage, Warp Drive Sticker $2.95 ea. In Stock These officially licensed stickers are about 3" to 4" in diameter, full color, carded and poly bagged. 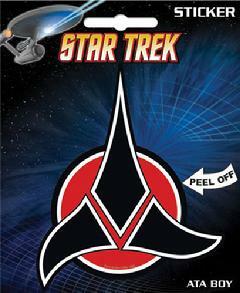 Item #45147 Klingon Logo Sticker $2.95 ea. In Stock These officially licensed stickers are about 3" to 4" in diameter, full color, carded and poly bagged. 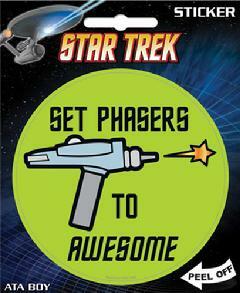 Item #451405 Set Phasers to Awesome Sticker $2.95 ea. In Stock These officially licensed stickers are about 3" to 4" in diameter, full color, carded and poly bagged. 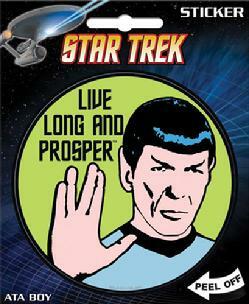 Item #45146 Live Long and Prosper Sticker $2.95 ea. In Stock These officially licensed stickers are about 3" to 4" in diameter, full color, carded and poly bagged. 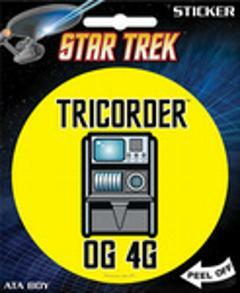 Item #45145 Classic Tricorder Sticker $2.95 ea. In Stock These officially licensed stickers are about 3" to 4" in diameter, full color, carded and poly bagged.